Staples fully realizes the Vaughn’s epic story. “This is how an idea becomes real” says the initially unnamed narrator on the opening page of Brian K. Vaughn and Fiona Staples’s mature sci-fi epic, “Saga”. From this point, and on each succeeding page, the ideas continue to manifest. As the story unfolds, but certainly before the first chapter concludes, it will occur to you that you are reading a book bursting with ideas; unique ideas that make you happy you read comic books, fresh ideas that make you yearn for the next unpublished chapter, and new ideas that make you, above all, want to share the story with someone because you’ve just read something special. Vaughn and Staples have produced an immensely enjoyable opening to their space-opera, a layered tale that introduces readers to star-crossed (literally) lovers, Alana and Marko, as they and their newborn daughter, Hazel, flee from an assortment of would-be captors and bounty-hunters. It is Vaughn’s penchant for strong characterization and excellent pacing, coupled with Staples’s ability for bringing humanity to her characters, where “Saga” finds its greatest successes. Alana and Marko are being pursued because their relationship is a forbidden one. Their home worlds, Landfall and Wreath respectively, have been at war for an uncertain amount of time, but we are to understand that it has been quite a stretch. Alana and Marko, both former soldiers from opposing sides, met and fell immediately in love during the war on the planet Cleave. In a clever piece of exposition, we learn that Landfall and Wreath have brought their war to other planets to keep from sullying their own worlds in destruction and blood. The couple receive a map of Cleave that should lead them to the fabled Rocketship Forest, a segment of the planet that may be their lone opportunity at escaping and finding a peaceful home to start their new family. Two factions are in pursuit of the trio: a couple of bounty hunters, here called Freelancers, with relationship issues, and a prince from the Robot Kingdom. The Freelancers are ordered to slay the couple and bring in the child, while the prince is tasked with murdering all three. Complications arise while Alana and Marko attempt to evade their pursuers, and the personal lives of said pursuers are also explored, but the gist of the story featured in the first volume of “Saga” is simple. Vaughn’s writing is as confident as it has ever been. His characters may be from a galaxy far, far away, but they continually refer to earthbound concepts and objects that would seem to have no place in the world of science and magic that Vaughn and Staples have constructed. References to ATM machines, romance novels, mobile phone apps and signals, and folding tables should be jarring considering the setting, but it works because Vaughn slides these references into the conversation delicately without making them the centerpiece; it never jerks you out of the story. Alana: Just tell me you weren’t lying when you said I’m the hottest chick you’ve ever slept with. Marko: I swear! Gwendolyn may have been tall, but her hips were boyish, not womanly like yours. Alana: You know, for a pacifist, you sure beg to get stabbed a lot. Vaughn infuses his story with an interesting cast of supporting characters, all of whom have been granted varying amounts of charm. The Will, described by Hazel as a monster, has so far been a fairly decent guy. He’s a macho Freelancer who has a clear idea of right and wrong, especially during a scene on the planet Sextillion where he struggles with how to come to the aid of a slave. Prince Robot IV is a royal who wants only to return to his pampered existence in the Robot Kingdom where his expecting wife resides. The lively cast is rounded out with a feisty, albeit brutal, Freelancer called the Stalk, and a hipster ghost named Izabel. The Stalk is one of Staples’s more frightening, yet beautiful, creations. Staples, whose work is entirely digital, brings Vaughn’s cast to expressive life. 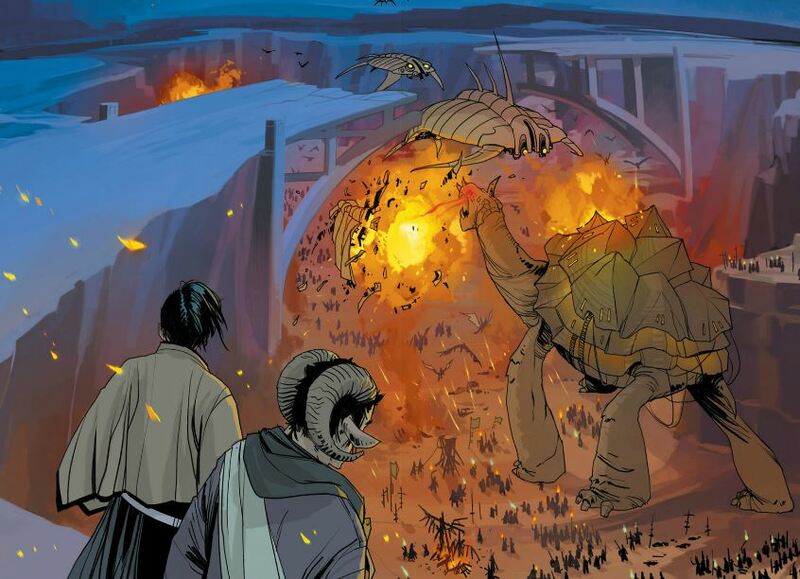 The artist’s character work is astounding and integral to the success of “Saga”. She communicates the tone of the voices Vaughn has given his characters. Whether it is the fear conveyed on Alana’s face when the Stalk faces down with Marko, or the manipulative glare an attendant on Sextillion gives the Will when she asks him if he wants to partake in debauchery, Staples has a masterful grasp of human facial expressions. Staples is also one of the best colorists in the business. Many of her backgrounds are suggested through simple strokes and lines of color. For example, the backgrounds featured during the opening chapter are exquisite. Little of it appears to be drawn; brushes of color are used to create lights, pipes, drawers, and stairs. Another powerful storytelling element is the narration by Hazel. There is an insightful poignancy to the words of Marko and Alana’s daughter, who we assume is narrating this story as an adult, but it is the way Staples incorporates the handwritten words into the panels that is so effective. They appear curved under the bottom half of Wreath, in the shadow of her mother, or simply alongside the action. Hazel’s words become part of the artwork in a way that makes them impossible to gloss over, and gives them greater magnitude. Lastly, Staples has brought an immensity to the world and characters of “Saga”. Her designs are as fresh and unexpected as Vaughn’s dialogue. The Stalk is a frightening female-tarantula hybrid, but she’s also dressed in couture. The worlds she creates are filled with futuristic elements and the familiar. Prince Robot IV’s palace is filled with a variety of antlers, which may not bode well for Alana and Marko’s prospects of eluding him. “Saga” is a near perfect tale of love and adventure that grips you right from the outset. Vaughn and Staples who poured their creative hearts into their work and the result is one of the most engrossing comic books ever published. If that isn’t something special, then I really don’t know what is.